Semiconductor design manufacturer AMD has brought ex-Apple employee Jim Keller onboard as its new corporate vice president and chief architect of microprocessor cores, the company announced Wednesday. Keller formerly worked as a director in Apple's platform architecture group, primarily focusing on mobile products. He's credited as having "architected" several generations of mobile processors, including the Ax chips found in iPads, iPhones, iPods and Apple TVs. "Jim is one of the most widely respected and sought-after innovators in the industry and a very strong addition to our engineering team," said Mark Papermaster, AMD's chief technology officer and senior vice president of technology and engineering, in a media release. "He has contributed to processing innovations that have delivered tremendous compute advances for millions of people all over the world, and we expect that his innovative spirit, low-power design expertise, creativity and drive for success will help us shape our future and fuel our growth," he continued. Abandoning mobile, venturing to tablets? According to the release, Keller will lead AMD's microprocessor core design efforts aligned with the company's "ambidextrous strategy with a focus on developing both high-performance and low-power processor cores that will be the foundation of AMD's future products." This comes at a time when AMD has essentially admitted it's getting out of the smartphone game, conceding the market to its larger competitors. These same competitors, such as Apple, appear to be exploring other markets as well. In July, former AMD processing expert, who's credited with spearheading AMD's Trinity APU, joined Apple as a "systems architect." Rumor has it Apple is moving towards developing its own mobile and desktop processors. The acquisition of Keller is likely a move to counter Apple's foray into the processor-sphere and to push further into PCs and tablets. 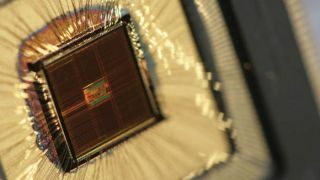 TechRadar reported in June that AMD has been changing its design methodology to make it easier to include third-party solutions like ARM's TrustZone architecture in their chips. ARM has been highly successful in breaking into the tablet market and AMD, armed with its most recent hire, looks to be readying itself to compete with the big boys.